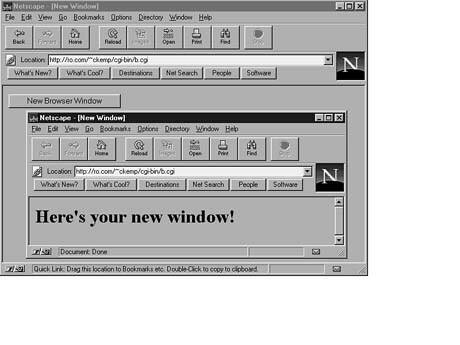 Ever wonder how you could open a new browser window? This simple example in Listing 5.2 illustrates how CGI.pm can be used to generate a form with a target element that points to a new window. When you click the button on the first page, a new window some_target is opened to display the output in the else clause. The output from Listing 5.2 is shown in Figure 5.4. Figure 5.4. The output from Example 2.
where -name is the name for the field. The other parameters are optional. The -default parameter specifies the starting value for the file name. The -size parameter is the size of the field in characters. The -maxlength parameter is the maximum number of characters the filefield may contain. Listing 5.3 shows an example of the File Upload field in action, the output of which is shown in Figure 5.5.